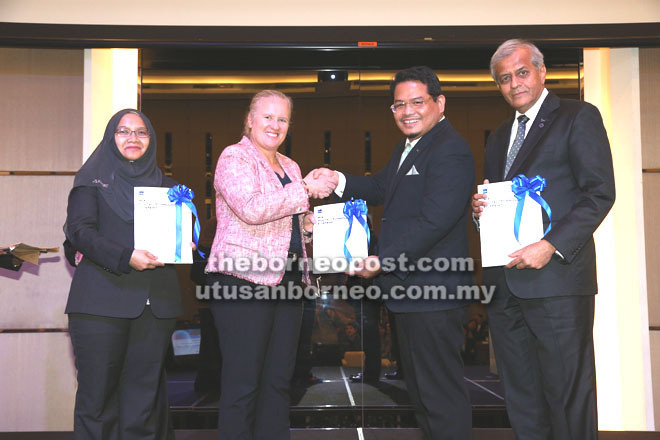 (From left) Nurmazilah, Grimes, MIA president Salihin Abang and vice president Datuk Narendra Kumar Jasani during the launch of the blueprint. KUCHING: To help accountants manage sweeping changes arising from the digital economy and Industrial Revolution 4.0 (IR4.0), MIA launched its MIA Digital Technology Blueprint at its inaugural AccTech Conference 2018. Both are part of the regulator’s ongoing digital initiatives as it seeks to future-proof the Malaysian accountancy profession and provide more value to the ecosystem. “The MIA Digital Technology Blueprint outlines 5 driving principles that guide the Malaysian accountants to respond appropriately to digital technology,” explained MIA chief executive officer Dr Nurmazilah Datuk Mahzan in her welcome remarks at the MIA AccTech Conference 2018. These are assessing digital technology trends, identifying capabilities, harnessing digital technology, funding and governance. The Blueprint also sets out the MIA’s roles in supporting members in the five principles, which entail educating and upskilling MIA members and accountants in Malaysia on emerging core areas such as big data analytics, cloud computing, automation and artificial intelligence. In his special address at the MIA AccTech Conference 2018, MIA President Salihin Abang expressed confidence that the Blueprint would help MIA members and accountants in Malaysia to adopt the technologies that suit their business, large or small. The Blueprint was prepared by the MIA technical team with inputs and guidance from MIA’s Digital Economy Task Force. The MIA AccTech Conference 2018 was graced by guest of honour Rachel Grimes, President of the International Federation of Accountants (IFAC), of which MIA is a member body. In her keynote address, Grimes commended the MIA for its efforts to prepare accountants in Malaysia for the digital economy and IR4.0. She also talked about the IFAC’s efforts to simplify technology applications for the Profession around the acronym ABCD which are Artificial Intelligence including Robotics, Blockchain, Cybersecurity and Communications, and Data Analytics. MIA AccTech Conference 2018 drew more than 400 delegates and featured 3 plenaries and 6 breakout sessions. MIA thanked its speakers, MIA’s Digital Economy Task Force, MIA’s Technology Committee and sponsors Fusionex International, Beans Group, Kollect Systems, Microsoft Malaysia, NUMA Solution, Wavelet Solutions and Autoscan Technology for their support in making the MIA AccTech Conference 2018 a success.